I never intended to write about THE INTERVIEW. In the past, I may have felt an obligation to check out every film out there, in some bid for what I deemed to be professionalism. But on Moviocrity.com, I was only going to write about the films in which I was really interested – the ones where I really wanted to devote the time (This is also why there are far more positive reviews on the site than negative, incidentally.). And THE INTERVIEW just wasn’t on my radar. After all, I didn’t care for the other Seth Rogen-Evan Goldberg team-ups – no, not even SUPERBAD. So, it just wasn’t something about which I had much curiosity. Then there was that damn Sony hack. I also hate writing about Hollywood journalism. But when it became about the way women are treated in the industry, I realized I had something to say about it. When the blame was placed on North Korea for the Sony hack, I had something to say about that too (Sure enough, recent evidence points to a possible disgruntled former employee, but who knows if we’ll ever find out for sure?). And then, when it came to actually threatening theater chains and then having THE INTERVIEW pulled, I had more to say still. Psychologists could probably have a field day with my compulsive need to put my thoughts on these matters in print, but if I didn’t there wouldn’t be much a site I suppose. In short, I now had to see THE INTERVIEW. This was no longer a comedy from two people whose previous collaborations had failed to impress. It was the focal point of a major studio takedown on which everyone from industry people, social media addicts and the U.S. government had commented. Now the film has premiered. Instead of a wide theatrical release, it can be seen with even greater ease, and what do you know, no massive invasion of the United States. The response has been just as mixed as reviews were from the preview screenings. Perhaps even more so, since the film has since taken on a sort of mythic quality that it could never live up to. 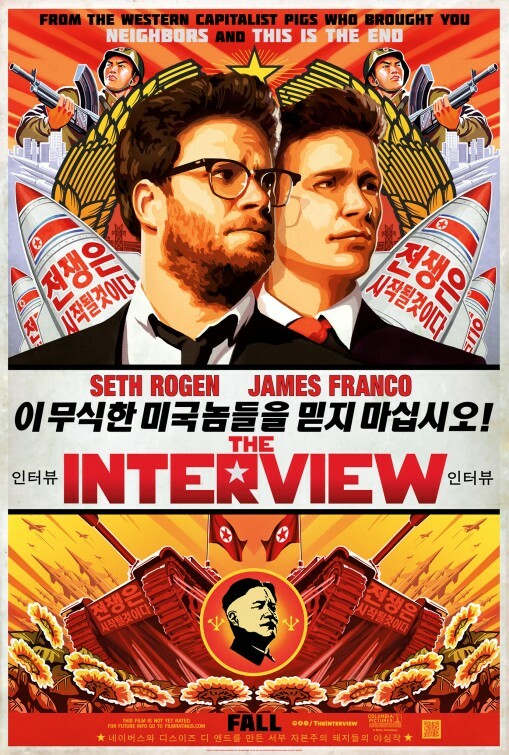 But the most surprising thing about THE INTERVIEW is that it’s a pretty entertaining film in its own right. Aaron Rappaport (Rogen) is using his journalism degree to bring as much prestige as possible to Dave Skylark (James Franco), an insipid and mugging entertainment personality who has nonetheless become Aaron’s best friend. While they get the occasional scoop, Aaron and Dave start looking to take the show in a more socially relevant direction. When it turns out Kim Jong-Un (Randall Park) lists Skylark’s show as a personal favorite, Aaron scores an unlikely interview with the North Korean dictator. Well, “score” might be the wrong word. Sure, they snagged a sit-down with the most world’s most controversial and elusive leader, but the interview would definitely be on North Korea’s terms. The questions would be supplied by the Supreme Leader and the whole thing would be a carefully supervised puff piece. Things get even cloudier when a CIA agent (the always great Lizzy Caplan) enlists them to poison Kim Jong-Un during the interview. This is satire, and a lot is done with the material. Kim Jong-Un shows Skylark what he wants to, and despite the constant warnings from Aaron, Skylark is momentarily swept up in this facade. He is then overdramatically shocked by the leader’s betrayal. It’s a clever plot-point that the filmmakers have actually toned down from reality. In the film, North Korea presents a fake grocery store to Aaron and Dave. But in reality, North Korea has actually built an entire fake town for propaganda purposes. Truth is not only stranger than fiction, it’s stranger than comedic fiction. The problem with a few of the other Rogen-Goldberg collaborations has been an overreliance on improv and riffing. This is present in THE INTERVIEW as well, though it has been scaled down. If improv is happening, Rogen and Franco are now better at concealing it. Most of the scenes end where they need to instead of the too-common practice of allowing them to go on and on. 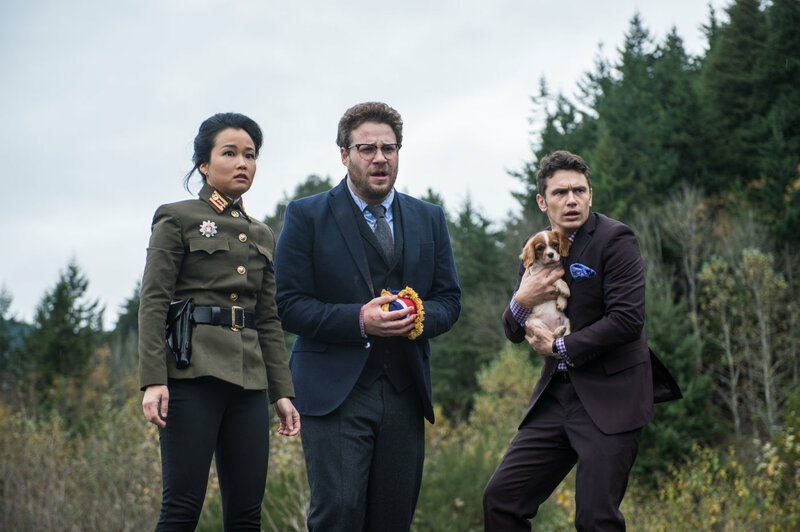 THE INTERVIEW is a real movie and perhaps the script from Dan Sterling aided in this. And yet, there are cracks. It’s fine to be amused with your own material, commitment is good. But we shouldn’t be able to tell how much you’re amused with yourselves. We’re the audience and we would like to be let in on the joke too. And while we’re at it guys, stop talking about your penises so much. It’s a lot funnier to you than it is to everybody else. And yet, defying expectations, THE INTERVIEW is one funny movie. The chemistry between Franco and Rogen remains intact while Caplan and Diana Bang make for fine additions. The film moves at a breezy pace and for once, that almost two-hour running time isn’t filled with the fat that has weighed down similar productions. Satire though it may be, THE INTERVIEW is no GREAT DICTATOR. It doesn’t inspire like the Chaplin film, nor does it try to. It’s a simple little film whose topical humor will ensure that it remains an artifact of 2014. If you’re looking for a revolutionary piece of cinema, you’re barking up the wrong tree. But the film did make me laugh out loud several times, and I’m sure that was the original intent, before all this craziness took over. Recommended.